Microsoft Outlook is the most widely used e-mail program and offers the most programmability. 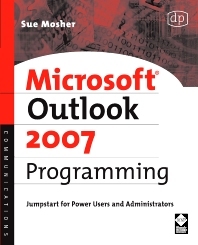 Sue Mosher introduces key concepts for programming Outlook using Visual Basic for Applications, custom Outlook forms, and external scripts, without the need for additional development tools. For those who manage Outlook installations, it demonstrates how to use new features in the Outlook 2007 programming model such as building scripts that can create rules and views and manage categories. Power users will discover how to enhance Outlook with custom features, such as the ability to process incoming mail and extract key information. Aimed at the non-professional programmer, it also provides a quick guide to Outlook programming basics for pro developers who want to dive into Outlook integration. 1: What you can do with Outlook? Sue Mosher is the author of six previous books on Microsoft Outlook and Exchange and maintains a web site at http://www.outlookcode.com devoted to helping programmers at all skill levels take advantage of Outlook’s extensibility. Her company, Turtleflock LLC, helps organizations get the most out of Outlook and other Microsoft Office products, providing custom application development and other support. Sue has been recognized by Microsoft with a Most Valuable Professional award every year since 1994. Sue is a Phi Beta Kappa graduate of the College of William and Mary, currently residing in Arlington, Virginia.